Everytime my Jeff asks me to grab something for him to put the veggies in, I smile... it makes you feel so good when you know how much money you are saving and how much better your own homegrown food is for your family. He did tell me I better not take a picture of him carrying this basket, lol. But as good as all this looks, there were two problems. 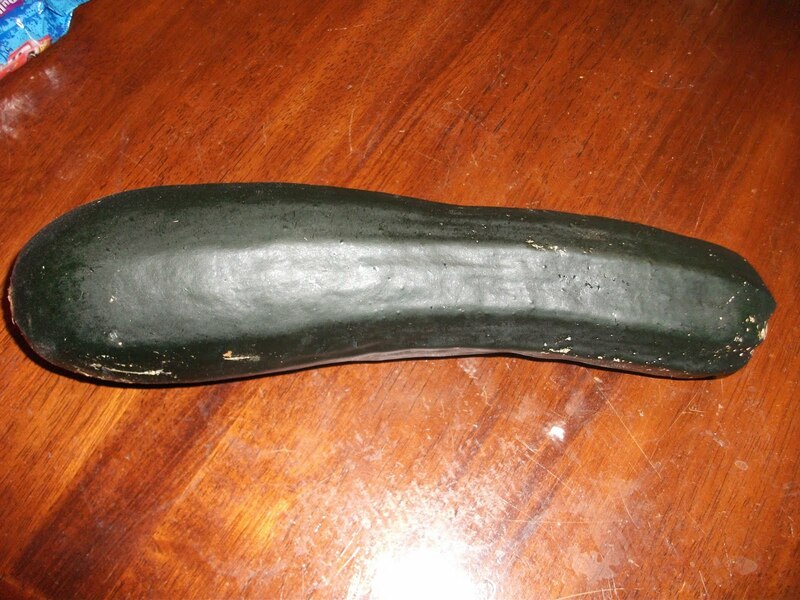 You should not let your zucchini get this big. It was hiding under the huge leaves of its plant. Because it is so large the taste will not be as good as it would have been had we picked it at half this size, so I will most likely use this in a loaf of zucchini bread. 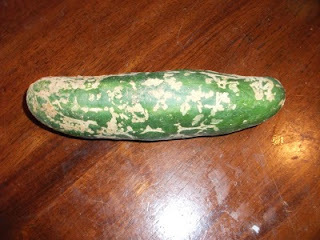 This cucumber was being choked by its plants vines. So Jeff took the vines and seperated them and put up a tomato cage and ran the vines up through it so the cucumbers will now be off the ground and the vines will not get tangled or strangle the cucumbers. My 4 year old daycare kiddo, Jay, loves to pick up each veggie and we talk about what we will use them in for his lunch or afternoon snack. He said he really doesn't want to eat this cucumber cause its sick, lol. This is him holding Li'l Priss when she was only 4 days old! He is my little man. Hi Cindi! 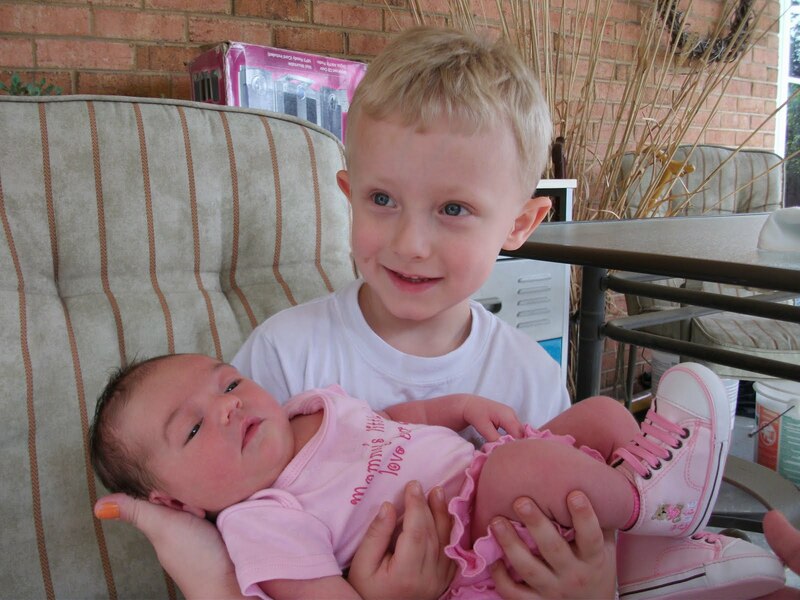 Saw your link on This for That, so I am now following you via GFC :) Thanks so much for linking up with us, and I LOVE the pic of your kids. So sweet! We have a garden too. Just waiting for our zucchini to get big. I love making things with Zuc. following you from ten talents. would love for you to follow me back. I'm following you from Lucas' Journey! I'd love to have you visit my blog too! I love your veggie pictures. I wish I could grow some myself! PS- our squash hides under leaves too. 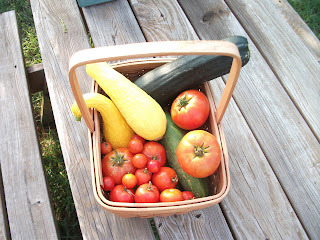 every year i say NO MORE SQUASH and NO MORE ZUCCHINI. and here we are another year finding vegetable baseball bats! !